The World Chess Hall of Fame hosts Grand Opening!! 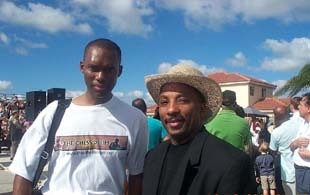 On a pleasant morning in sunny Miami, Florida, hundreds of chess enthusiasts trekked across the U.S. on December 16th to witness the grand opening of the World Chess Hall of Fame. Conceived by philanthropist and inventor Sidney Samole, this building is visually stunning. Approaching the area, one can see the building distinguished by the 45-foot towering rook built into its architecture. 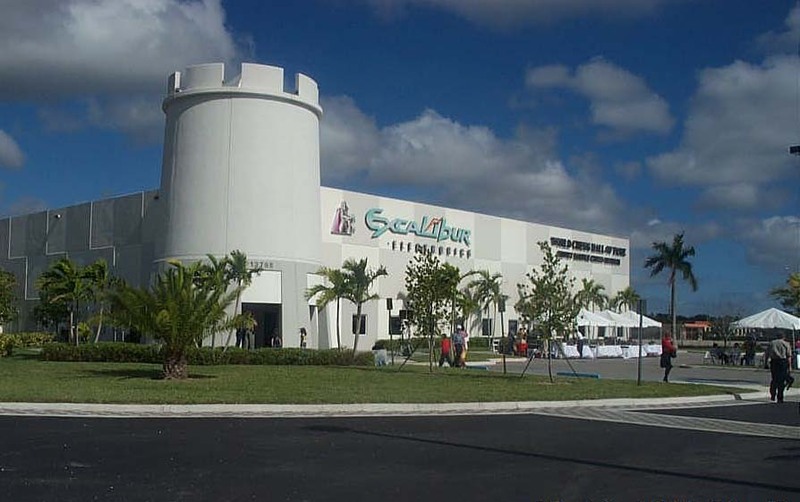 The brilliant white building can also be seen from the Florida Turnpike and has a very elegant appearance. In the reception area, the walls are adorned with attractive wood paneling, decorative wall furnishings and tropical plants. This area leads into the exhibition hall. More on that later. The atmosphere was festive as the attendees primarily consisted of families with small, energetic children and adults who perhaps wanted to be part of chess history. Many seemed to enjoy the festivities which included a "Live Chess" enactment (complete with medieval regalia and swords) and the "Hall of Fame" simultaneous exhibition. The simultaneous exhibition was interesting not only because "Hall of Fame" players took on all comers, but the GMs played in successive waves or "relay chess." After GM Lubomir Kavalek started the games, GM Arthur Bisguier took over the position, followed by GM Arnold Denker. GM Lev Alburt also joined in the fray, while IM Bruce Pandolfini and local IM Blas Lugo of the Miami International Chess Academy concluded the lists of simul masters. Those who were not outside explored the spacious and exquisite exhibit hall. For only a nominal donation, visitors stepped into the world of chess intrigue. The self-guided tour began in a dimly light room with a ceiling accented with tiny lights embedded into a black background. This may give one the feeling of timelessness while gazing display cases which illustrated some important relic of that period. There were stunning chess sets that were hundreds of years old and vivid depictions of the royal game. 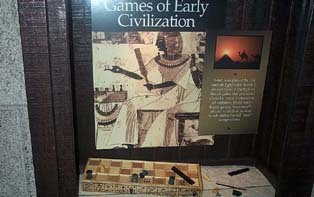 One interesting display was that of the ancient Egyptian period, a time when a board game called "Senet" was played. This game was said to have preceded all forms of chess by centuries and is played on a 3X10 board with dice. The computer exhibit was intriguing because it had an original Altair 8800 computer… the same one Bill Gates worked on with Paul Allen to create Microsoft! The display provided details of the Sidney Samole fame which began with his invention of the first electronic chess set marketed under Fidelity Electronics. The late Mr. Samole got the idea from watching an episode of "Star Trek" where Spock was playing 3-dimensional chess with the ship's computer. Since there is almost an endless amount of computer programs today, his vision appears to have set a trend. The book store seemed to be doing a brisk business and sold a variety of equipment, paraphernalia and books. Although the book selection was limited, they did decide to include the booklet on the Wilbert Paige tournament! One of the other interesting points of the museum (there were many) was a audio-visual presentation. This essentially amounted to an impressive documentary on chess and its importance in the greater society. Set in a theatre room, the video included footage from past and present including historic figures and important events. Truly captivating! All in all, the afternoon was pleasant as everyone seemed to enjoy themselves with the endless diversions that were available. The museum will certainly develop over time. Nevertheless, it provides an example of the proud legacy of chess.